Four-legged creatures, rolling vineyards, citrus orchards, the sweet smell of fresh figs and a strong family bond that ties everything together perfectly. These are just a few features of Uitkijk, a beautiful family farm situated at the slopes of the majestic Paardeberg Mountains. Home to the sixth generation Eksteen family, it was established in 1857. To this day, the horse stables and their regal residents remain the heart of the farm. After all, they kept it running in days of yore. Fast-forward to the 21st century and you‘ll find an establishment steeped in traditional values and innovative ideas. With the perfect combination of soil content and climate to deliver the best produce. Plus the natural setting and enough farm-style elegance to play host to the most charming of weddings. And the wine? Let’s not get started. It’s far better to experience it. 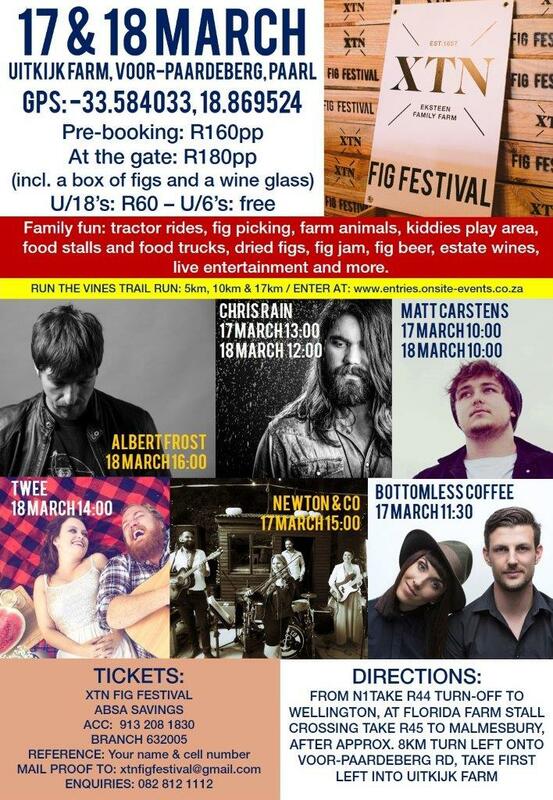 Fun for the whole family: tractor rides, fig picking, farm animals, kiddies play area, food stalls and food trucks, dried figs, fig beer, estate wines and live entertainment by Matt Carstens, Chris Rain, Bottemless Coffee, TWEE, Newton & Co and Albert Frost. Don’t delay, book now, filling up fast. Please get in touch if you have any questions. We’d love to hear from you! Contact Jan on 082 328 4372 or info@xtnfamily.co.za.